To say that I was petrified to give birth would be an understatement! Having been a caesarean baby myself I had resigned myself to the fact that I too would likely have a caesarean. I felt that opting for a caesarean would allow me to avoid my fear of giving birth vaginally and would allow me some control over the birth of my baby; in a situation that I perceived to be very uncontrollable. However, my partner felt quite strongly about me considering the option of a vaginal birth, given that I didn’t have any physical or medical issues preventing me from attempting this option. However, my anxiety about the prospect of a natural birth was something that I didn’t think I would ever be able to overcome. My sister-in-law had completed a Hypnobirthing course during her second pregnancy and highly recommended it. Yet, I knew very little about what the course entailed, so I did some internet research which lead me to meet Christa from Hypnobirthing Australia. Christa’s passion, enthusiasm and belief in the Hypnobirthing Australia course was inspiring and reassuring. However, I remained quite skeptical about the course's ability to shift my negative perceptions about birth, and my fears about the prospect of delivering vaginally. However after commencing the course I was amazed and surprised at how well I connected with the material in the hypnobirthing sessions. While hypnobirthing has a strong psychological foundation, I found it to be a really practical course. For the first time I began to understand the purpose of contractions. I had always been told by others that contractions were some unexplainable pain experienced differently by each individual; however Christa fostered a belief that the ‘pain’ aspect of labor wasn’t imminent or necessary as I had control over how my brain interpreted the sensations associated with my body’s contractions. Thinking this way was life changing! Hypnobirthing really got me to believe in the ‘mind over matter approach’ to childbirth, while Christa fostered a belief in me that a positive birth experience was possible for all women - even me! I had never really met anyone with a ‘positive birth experience’ before doing the hypnobirthing course, nor did I believe in the benefit of having a ‘birth plan’; yet Christa assured me that 90% of a birth can be planned for, with 10% being left to chance. After commencing the hypnobirthing course I realised that I had over-complicated the birthing process in my head, and had taken on board too many people’s horrible birthing stories (which we all commonly hear about). Challenging my own negative beliefs about birth was something that the hypnobirthing course directly tackled; allowing me to gradually believe that I too deserved, and could have, a positive birth experience. I was utterly surprised to learn that the key to a calm birth experience was about remaining as relaxed and calm as possible (which is the polar opposite approach to I would have taken without having done the hypnobirthing course). In the lead up to my labour I had written myself a note saying; “there are only two steps to having a baby”: 1). Waiting for my body to open (dilate to the 10cm’s) once my baby was ready and 2). Breathing the baby out! Whilst it seemed simple in theory, I was still very unsure about my ability to remain calm in facing my fear of birth. However the hypnobirthing course also allowed me the opportunity to unpack these fears by explaining the way the human brain functions and cementing the possibility of a positive birth experience into my mind. In the lead up to the birth I had practiced reciting the ‘positive affirmations’ contained in the hypnobirthing course, which helped me to believe in the fact that “my body and baby knew how to birth”. My job was to switch off my analytical brain in order to allow my body to do what it was designed to do. Hypnobirthing provided me with a structured way of relaxing, and the mantras recited on the hypnobithing CD’s allowed me to condition my brain to believe that I was going to have a positive birth experience (although I was still unsure of the reality of this being able to occur!). After completing the hypnobirthing course, both my partner and I felt more informed about our birthing options and the benefits of a natural birth experience (which was such a different head space to be in from when I had commenced the course!). Having practiced the skills I had learnt throughout the hypnobirthing course with my partner (the visualizations, affirmations and massage), we felt somewhat prepared for the day of our baby’s birth. I couldn’t believe how the preparation incorporated into the hypnobirthing course had helped my anxiety subside, and allowed us to feel somewhat in control of what I had always seen as a very unpredictable situation. The course also sparked lots of meaningful conversations between my partner and I about our fears and anxieties about the birth process and parenthood; which really helped us prepare for the birth of our child as a couple (as much as was possible). The information provided and discussed as a part of the hypnobirthing course also allowed my partner and I to feel that we were equipped with enough information to make informed choices throughout the labour; especially when it came making decisions about consenting to being induced (to help the contractions along), pain medication and vaginal examinations throughout the labor. On the day of my birth; my waters had broken at 5am, with contractions starting at 6am. Shortly after I traveled to the hospital with my partner and I began listening to the hypnobirthing soundtracks in an effort to get my mind and body to relax as much as possible during labour. Having visualised how I would ideally like my birth to go, I had created a birth plan which the hospital staff were provided with, which informed that I would like to aim for a natural water birth without any pain medication (if possible). After 5 hours of contractions the Doctor recommended that I be induced with syntocinon to help the contractions along. 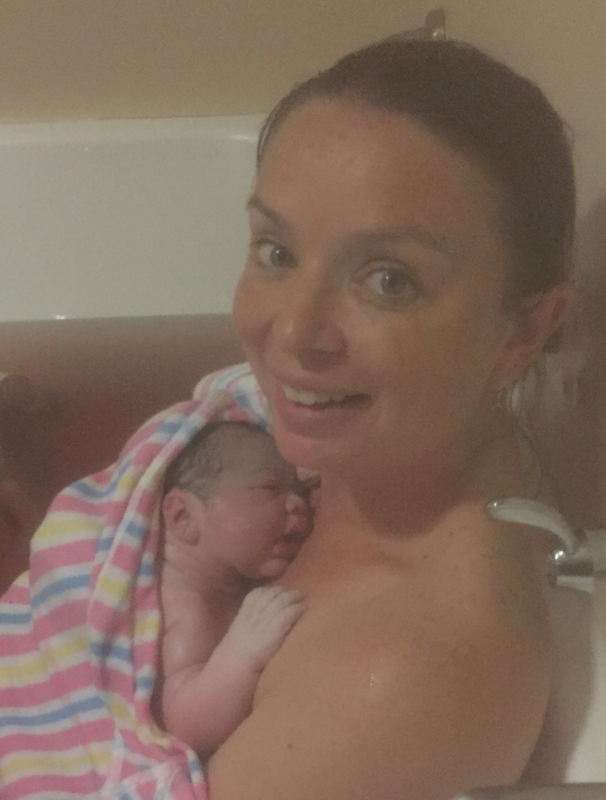 Once ‘active labour’ commenced I was able to enter the bath, where I continued to labour until the birth of our beautiful baby girl at 10:30pm that evening. Having gone from being petrified about birth, to immersing myself in the belief that I was capable of having a positive birth is due to the amazing support of Christa and the Hypnobirthing Australia program. Before being exposed to the hypnobirthing course it would have been unimaginable for my birth to have gone the way that it did. I am pleased to report that I am one more woman who can stand testament to the positive impact the hypnobirthing course had on my birthing experience. Being able to look back on my birth experience with joy is such an incredible thing, and something that I would have never ever thought would be possible. From the bottom of my heart I truly want to thank Christa for the incredible support she showed me throughout my pregnancy and birth and for the amazing gift of self-belief and inner strength that was instilled in me in the lead up to the birth of our first baby. I don’t think I have ever met such a kind and passionate person. Hypnbirthing is a course that I feel all women should be exposed to, not only to increase the likelihood of a positive birth experience, but to also allow all women to feel empowered about their own birth experiences.